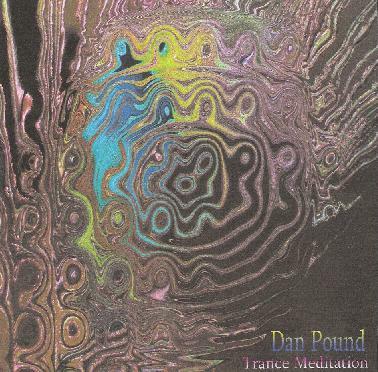 Dan Pound - "Trance Meditation"
On his web site, Dan Pound refers to his music as ambient electronic, new age, shamanic, deep-zone space music. I can hear all of these elements in this recording, but with a definite emphasis on the deep-zone space music direction. Trance Meditation is divided into seven tracks (titled Trance Meditation Parts 1 through 7), but it is really one entire, nearly hour-long journey into the outermost reaches of the universe. The 10-minute long opening track is pure space music, with icy, minimalist atmospherics, cosmic winds and deep galactic breaths. This definitely sets the tone for the entire rest of the work, but as the journey continues, elements like didgeridoo, occasional shamanic vocalizations, and subtle rhythms emerge from the mix, adding a warmer, organic element to the chilling spacescapes, without being intrusive or taking over. Towards the end Dan even adds some bell like sequences and some subtle symphonic textures. But these touches are nicely restrained, allowing the music to be what it really wants to be. At its heart, Trance Meditation is still all about space. And this space is deep, and definitely worth exploring. For more information you can visit the Dan Pound web site at: http://www.danpound.com.